Anyone who has been reading my blog for awhile knows I love WeekDate planners and their Only Write It Once method! 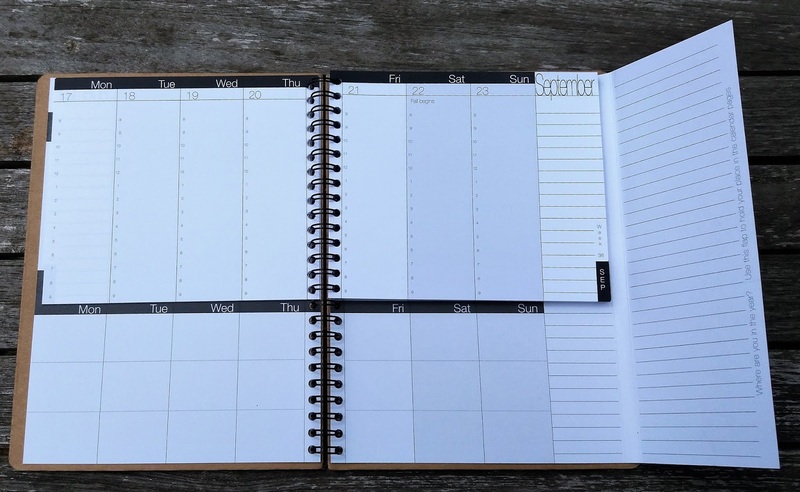 Kay Odell, the creator of WeekDate planners, is a genius. 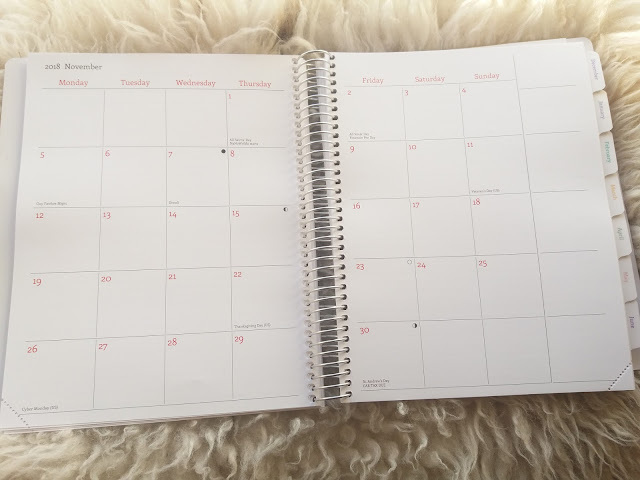 She came up with a paper planner that captures all of your recurring events in one spot so you only write them once, yet can still see them every week with no rewriting! How did she accomplish such an amazing feat you ask? Hang on and I'll show you in a sec. Let me walk you through the planner. 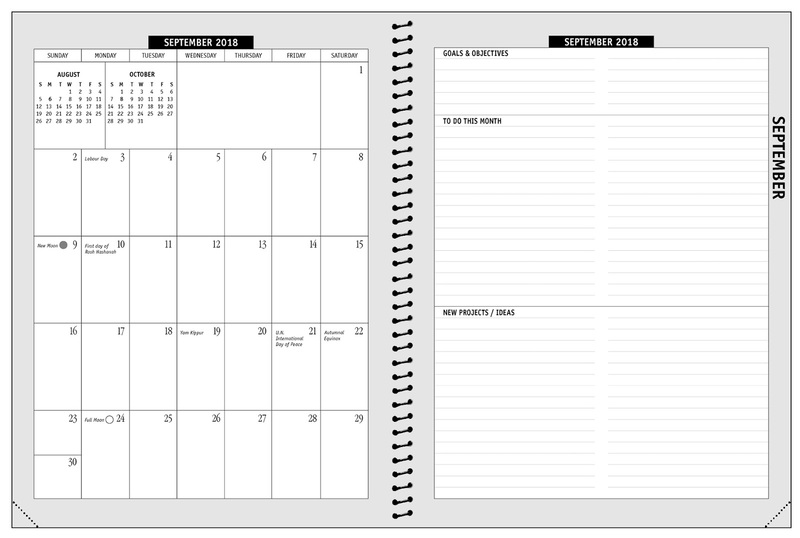 The academic year WeekDate planners have a slightly different layout than the calendar year ones, but the Only Write It Once concept is the same. The academic year planners measure 6.75 by 8.75 inches closed, which gives you a nice big page size but the book itself is slim and very light, much lighter than other planners of this size, so you can very easily carry it with you everywhere. 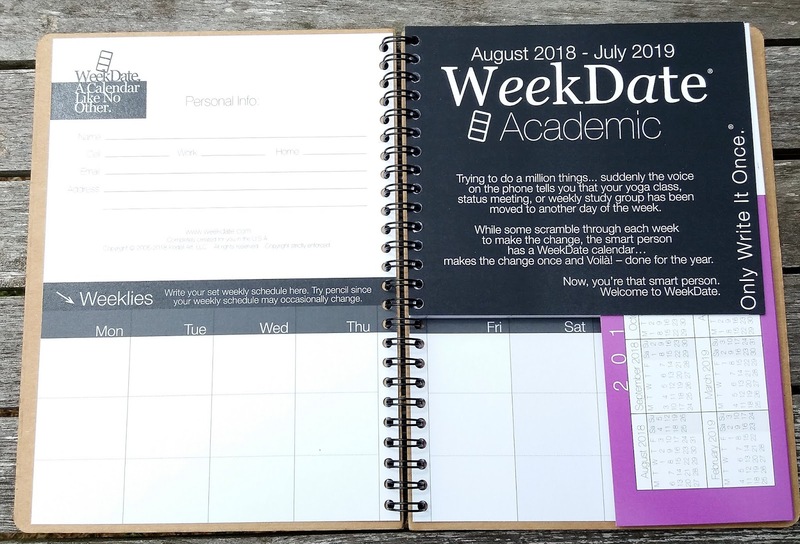 You can see lots of details and specs of the academic year WeekDate planners here. I'll also show you photos of these details too. The outer cover is lightweight chipboard to give you a firm writing surface no matter where you are. The inside cover comes in 6 different colors. This year's colors are black Exec, blue Breathe, green Between The Lines, pink Fizzy, orange Brazen, and (my favorite) purple Vigor, shown below! This is where you write recurring events (in pencil obviously so you can change them when you need to). This is where you write your class schedule, after school activities, recurring meetings, trash day, rotating weekly menus, anything that happens every week. You can also write things that happen every other week and still keep track of them because the week number is printed on each week. So for example I write on Wednesdays to put out the trash on even weeks and the recycling on odd weeks. Each day you just look up and down the column to see everything going on that day, whether they happen just on a specific day or on that day every week. So simple! So brilliant! Each day's space is divided into 3 blocks you can use for morning/ afternoon/ evening; parents can use them for work/ personal/ family or for different family members; you can use them for school/ work/ social; or in any way that works for you. SO. For example, say you (or your kid if you are a parent) has an activity that is on Tuesday evenings from 4-6 pm from August 14th until November 13th. On the Tuesday spot you can write the name of the activity, time, start and end dates. Now EVERY WEEK that will be visible! You don't need to rewrite it each week! When the activity comes to an end, you just erase it. And if for some reason the date changes, for example it switches to Wednesdays instead, you don't need to erase and rewrite it each week! You erase it ONCE and write it on the new day ONCE and you are done! Wow! I just love the elegant simplicity of this method. It really does make your life so much easier. Side note: each WeekDate planner comes with a pencil and eraser. Somehow I failed to get a photo of the pencil, but the WeekDate pencils and erasers are my crazy-favorite. The pencils write so nicely, and the erasers erase so well. I hoard them. I hide them from other people. Seriously, they are great. Look again at the right side of the bottom area and you'll see a lined space that also stays visible all the time. This is where you write things that happen on a specific date each month. This is where you write, for example, rent due on the 1st each month, etc. 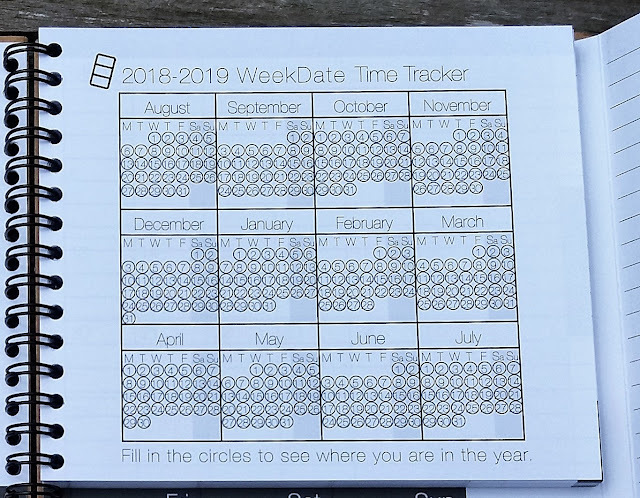 There's a tracker page where you can fill in the dates for each day you, for example: exercise, write pages of your dissertation, don't spend any money, or anything else you want to track. 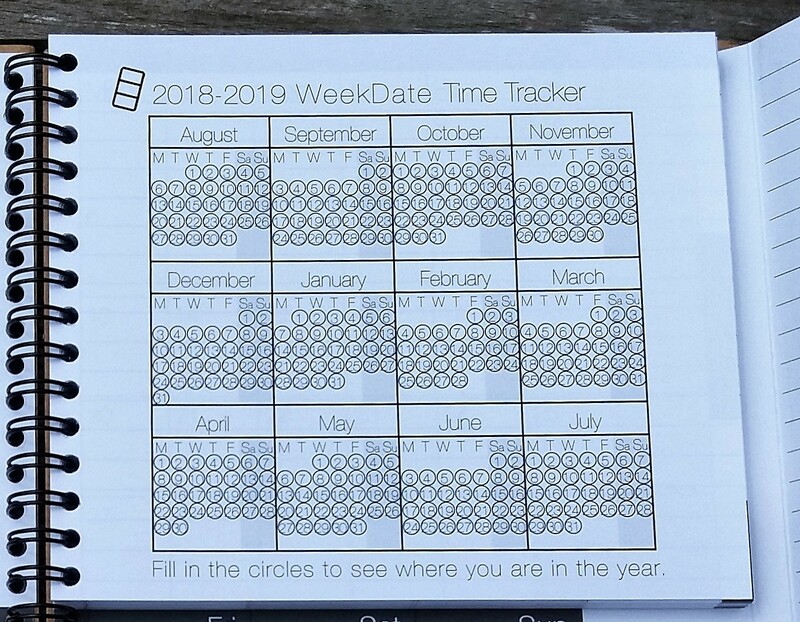 Or you can fill in each day to see your progress through your year, or days leading up to the big day (graduation, wedding, moving, starting a new job). This visual is very powerful in getting your brain to face up to reality and keep you on track! Monthly pages! There are monthly calendars and notes pages embedded in the weeks to give you an overview of your month and a space to write your montly goals. Another wonderful thing about the WeekDate Academic planners is you can cut out the pages and hole punch them to fit into a Filofax or similar brand A5 ring binder, or a Franklin Covey Classic size ring binder. The holes will go into the writing space on the pages just a little bit, but not too much. Make sure to get the colored cover punched and put in there too, so you can write your recurring events on the inside bottom of the cover. But yes it works just as well punched and put into a ring binder. I've done this in the past and love it. I haven't tried cutting out the pages to use a discbound system with it but it's a similar idea and I don't know why that wouldn't work too. WeekDate planners are great for folks with ADHD, people juggling multiple roles, parents, students, and anyone with a busy schedule because you see everything in front of you all the time and nothing slips through the cracks! 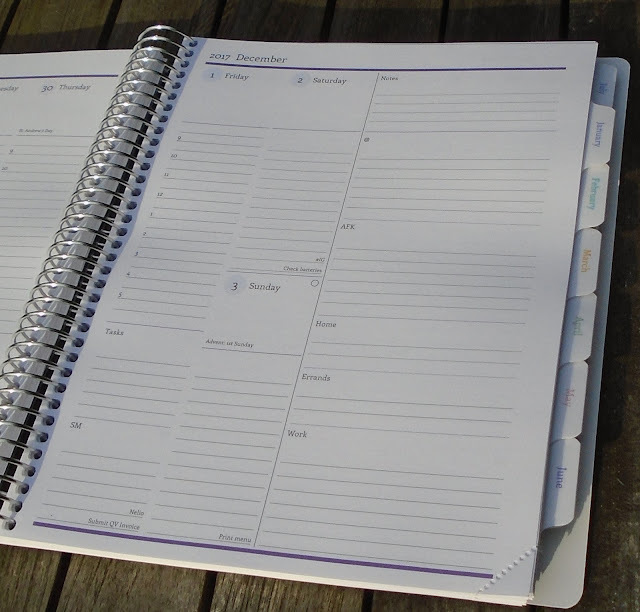 WeekDate planners are printed in the USA and the WeekDate offices are run on solar power. WeekDate planners are only available at WeekDate.com and they ship worldwide! Go check them out and see all their products. 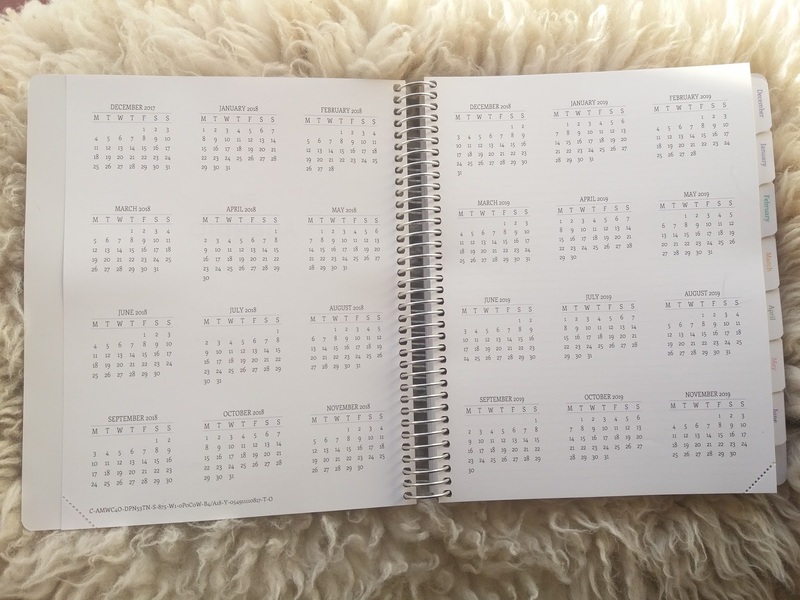 The planners have only one print run all year, and once they are sold out, they are gone for the year! Some colors sell out very fast too. For example as I write this the blue Breathe covers are already almost gone. So don't wait to grab the planner you want! These planners also make wonderful gifts. Anyone would love the gift of organization all year! Find all the answers on their FAQs page. And be sure to find them on Facebook, Twitter, Instagram, YouTube, and Pinterest! 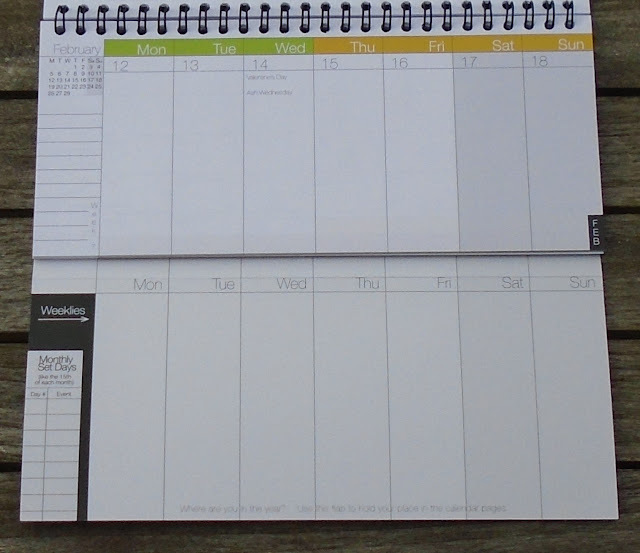 Many thanks to WeekDate for providing me with this planner as a sample to review! All opinions are my own. I love everything about this planner and the small, family-run company. Here is a planner company that doesn't get nearly enough attention, in my opinion: Polestar Calendars (PolestarCalendars.com). 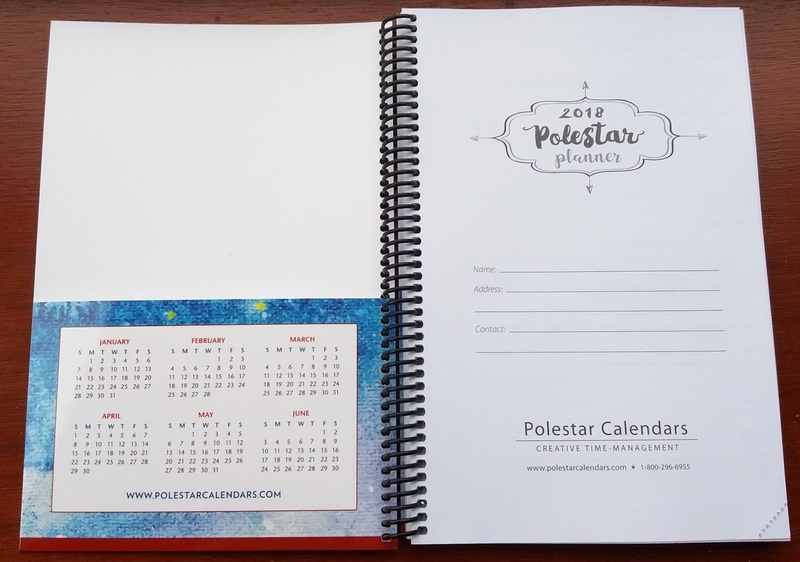 Located in British Columbia, Canada, Polestar Calendars is a small, family-run business. They print all of their planners in Canada, on 100% post-consumer paper. Polestar Calendars are available at stores throughout Canada, and online from PolestarCalendars.com and other retailers, including Amazon USA and UK. I ordered directly from the website, but if I had been smart and ordered earlier in the year I could have found it on Amazon UK and avoided international shipping fees. International shipping from North America is just expensive, and it's not their fault. They aren't making any money on the shipping, that is just how much it costs. I have already pre-ordered next year's planner from Amazon UK with free shipping! Look around online to find the best deal for you. 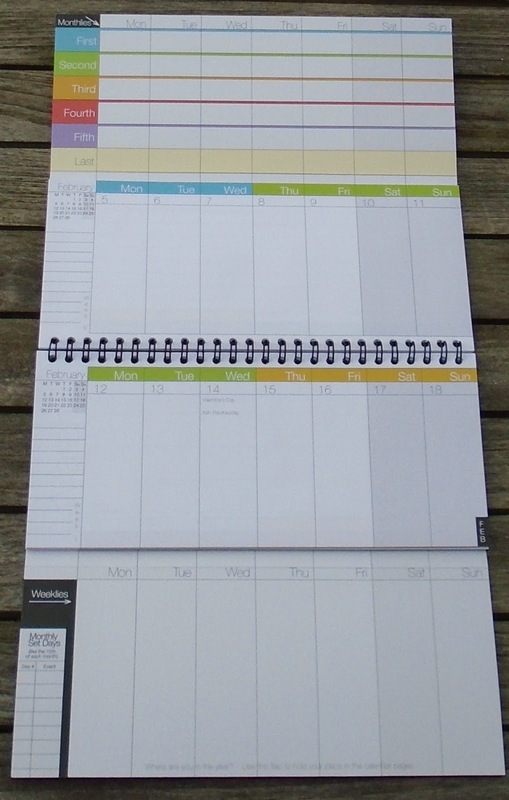 Polestar Calendars all have excellent formats designed to help you in any lifestyle. They are probably most famous for their Student Planner (designed to help you organize your studying, deadlines, exams, and life in general) and their Family Calendar designed to help you organize the whole family. They also have the beautiful Inner Reflections planner with nature photography and inspirational quotes, as well as the two planners I'm about to show you. I decided to try their Business Agenda and the Polestar Planner. I will walk you through each planner and show you the features. All photos/ images used with permission. 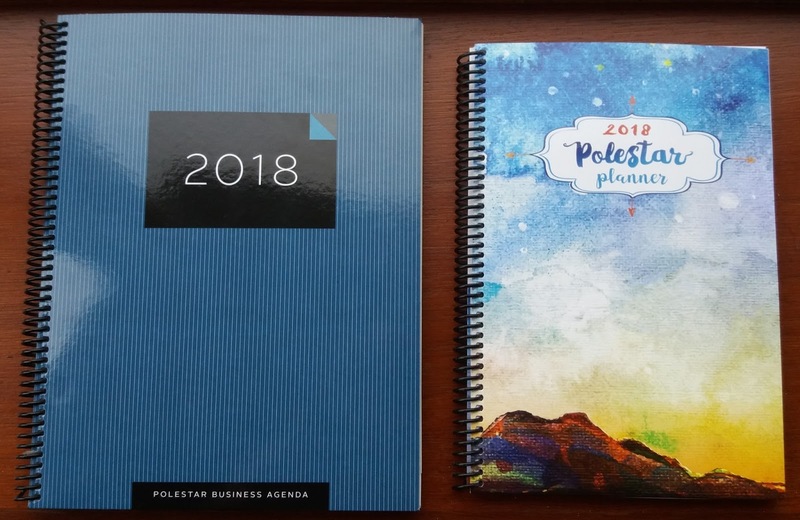 Below are the covers of the Business Agenda (left) and the gorgeous art of the Polestar Planner (right). 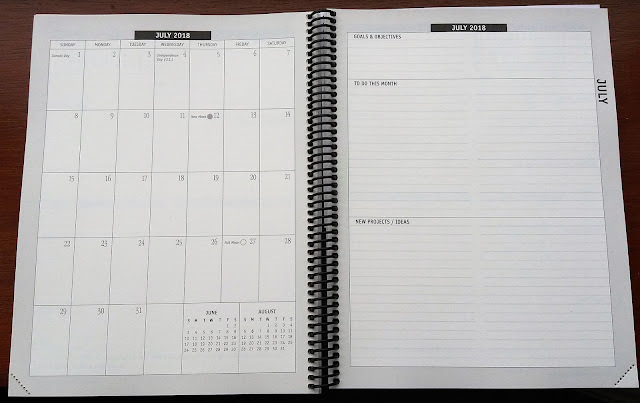 Both planners are spiral bound so they can lie flat on your desk or be folded back on themselves. The soft covers keep the books lightweight and very portable. First I'll take you through the Business Agenda. Get ready for some gushing because I am in love with this planner! I'll show you why and tell you all about it. The Business Agenda measures 8 by 9 3/4 inches and is not thick, so it's a very manageable and portable size. The generous page size gives you plenty of room to write. I absolutely love the weekly layout. My photo (below) is not the clearest so please scroll down to their image from the Polestar Calendars website. On the left page, the left space of each day is where you write your scheduled events, the middle space has a generous area to list your work tasks, and the right space is for your personal tasks. I work from home, so I was very excited to try this layout to visually divide my work vs personal/ home tasks for each day. This helps me focus on work when it's work time, and see what I need to do the rest of the time, separately. I think this layout is sheer genius. Of course you could also re-label the categories to fit whatever works best for your life. On the right page you'll see the weekend days have nice big spaces, and there's a large Notes area which is a great landing spot to jot those random things that pop up during the week. The bottom half of the page has two list areas with square checkboxes at the front of each line, which is where I like them to be so I can use them to indicate priority and then check them off when each task is done. I'm using the left list for work tasks, and the right one for personal/ home/ family tasks. Again I love having the separation of work/ personal, it helps me focus on what I'm doing at that time. Canadian and USA holidays and phases of the moon are printed in the day spaces. Each week there is an inspirational quote. You can't tell from my photos but the paper in the Business Agenda is a warm off-white that is easy on the eyes. Get ready for me to gush some more: I love the monthly pages. They are embedded within the weeks, which I used to not care for but have recently converted to loving because I end up using the monthly pages more. Again my photo is not the best so please scroll down to the next image, taken (with permission) from the Polestar Calendars website. I love the right page with Goals & Objectives, To Do, and Projects for each month. I'm finding it very useful to see these alongside the month for easy planning of the big-picture goals, plans and ideas. I drew a line down the middle of each monthly Goals/ To-Do/ Projects page, and am using the left side for work and the right side for personal. There are monthly overview pages to help you plan longer-range projects. 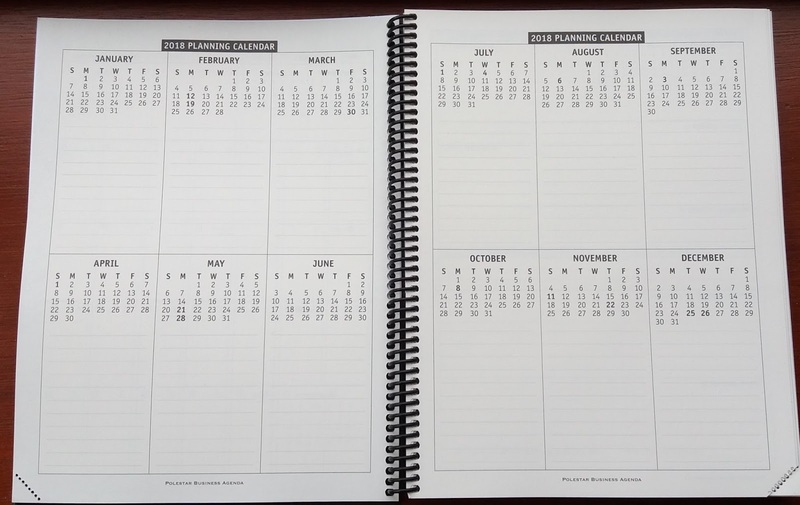 There are also monthly planning pages for the future year, so you have a place to plan into the next year. There are also pockets inside the front and back covers of the planner. These pockets hold full size pages folded in half. The Business Agenda also has Contacts pages, USA and Canada reference pages, and several lined pages for notes. Perforated corners allow you to find your current page easily. 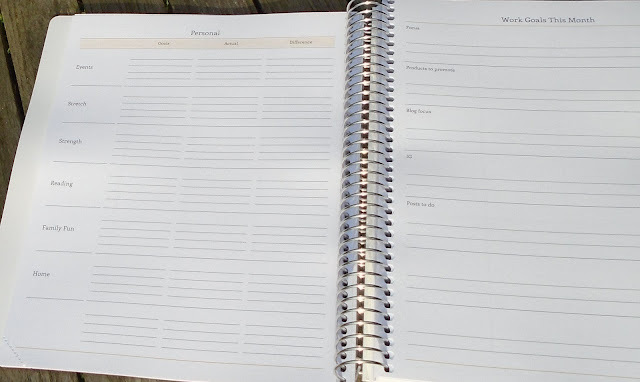 This is a very comprehensive planner that is flexible in its design so you can use it in any way that works best for you. 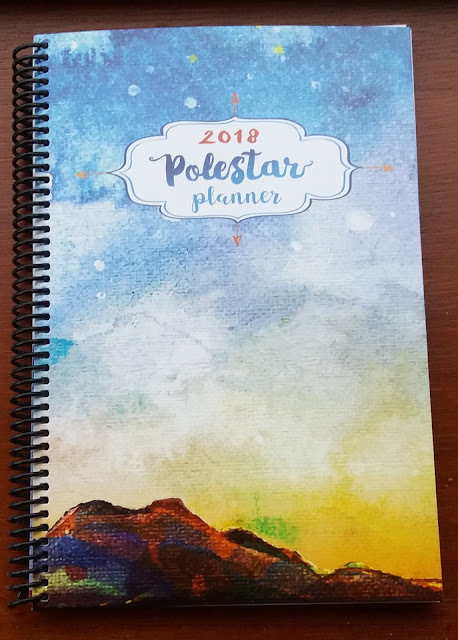 Next I'll show you the Polestar Planner. This is an excellent, portable and affordable planner that also has a very flexible format so you can use it in any way you need. The art on the cover is beautiful! The Polestar Planner measures 6 by 9 inches and is very slim and lightweight so you can take it with you everywhere in your bag. 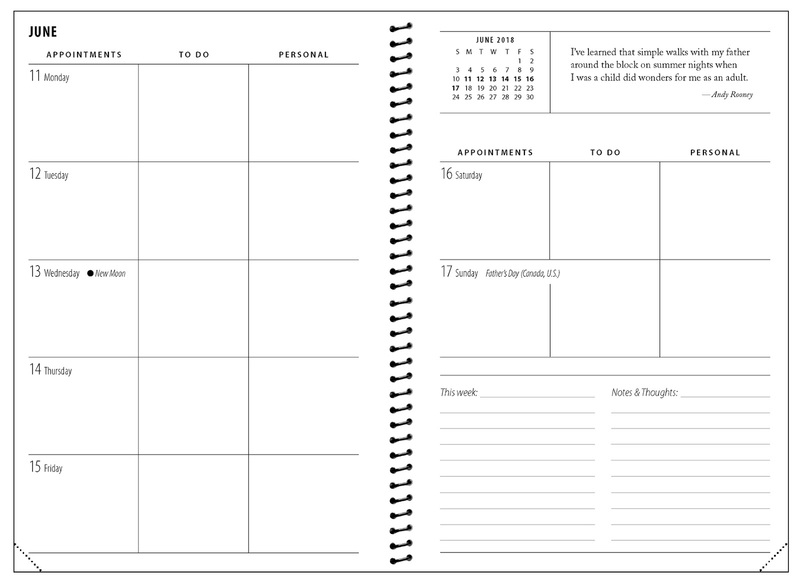 The weekly layout has big open spaces to write your appointments, tasks, and personal items. Or of course you could re-label these and use them in any way you like. Again my photo is not the best so please scroll down for a clearer image. Each week has a space for lists and notes, and an inspirational quote. Below you can see a better image. Each month there is a page for tasks, projects and notes. And pockets inside the front and back covers of the planner. 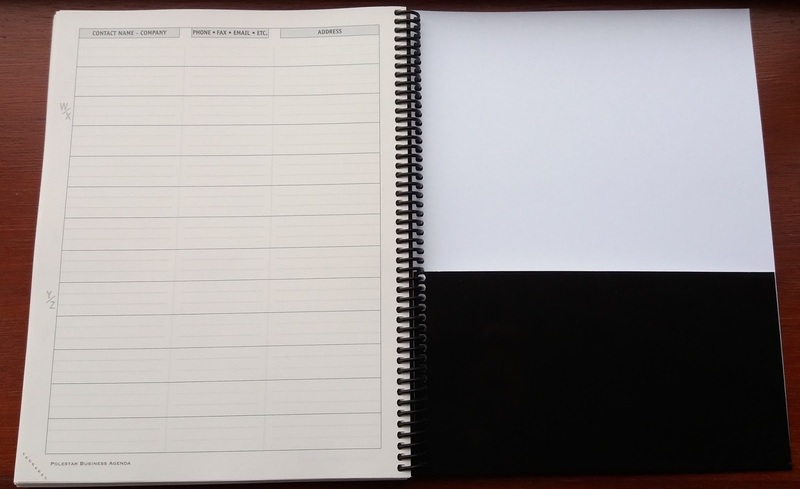 There are also Contact pages, and several lined and blank pages for notes. 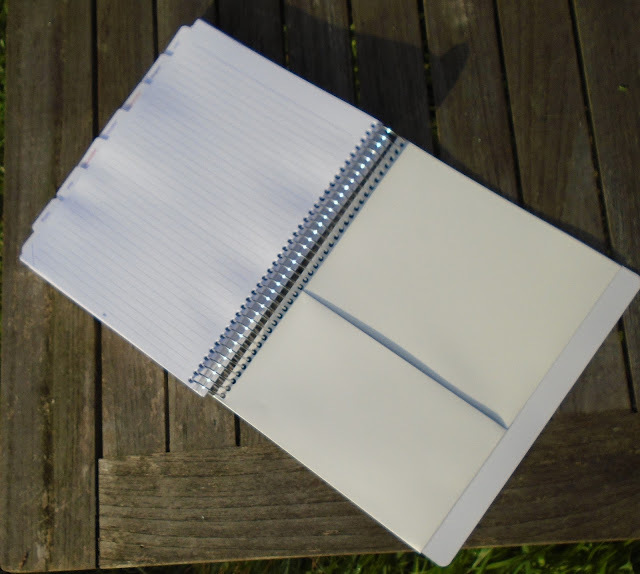 The paper in the Polestar Planner is bright, clear white. The tear-off corners let you mark your current page. This is a fantastic planner at an excellent price! I am absolutely in love with these planners and with this company. Check out their website, you are sure to find a planner to fit your lifestyle! You can find all the Polestar Calendar products at PolestarCalendars.com! Disclaimer: I bought these planners myself. This post does not contain any affiliate links. 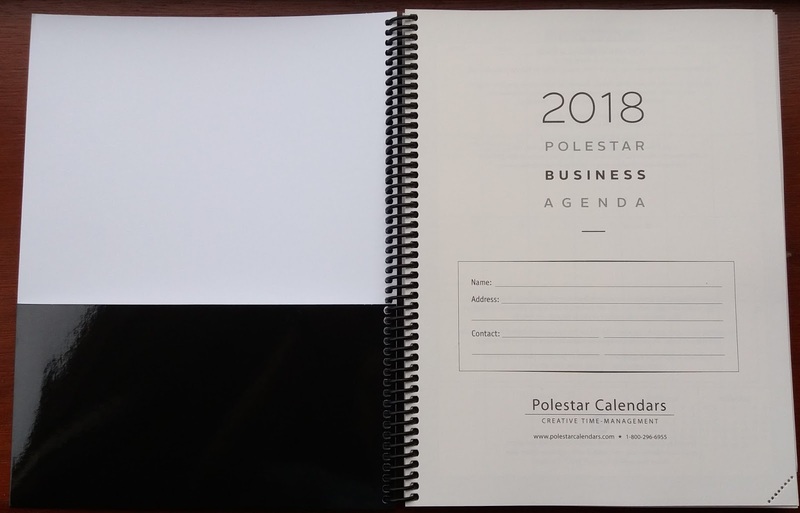 I am not affiliated with Polestar Calendars in any way, I'm just a very happy customer! Plannerisms mentioned in Wall Street Journal! Recently I received an email from a reader letting me know Plannerisms was mentioned in the Wall Street Journal! The article is called Paper Planners In The Digital Age by Lane Florsheim. You can see the article here. 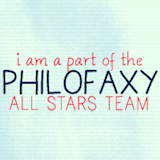 I was very surprised and flattered to be mentioned, along with Philofaxy which is run by my friend Steve and to which I also contribute. I don't post very often on Plannerisms these days, because I post four days per week on QuoVadisBlog.com and the first four Fridays of each month on RhodiaDrive.com. So please be sure to take a look a those blogs for lots more articles on time management, journaling, bullet journaling, planners, etc! 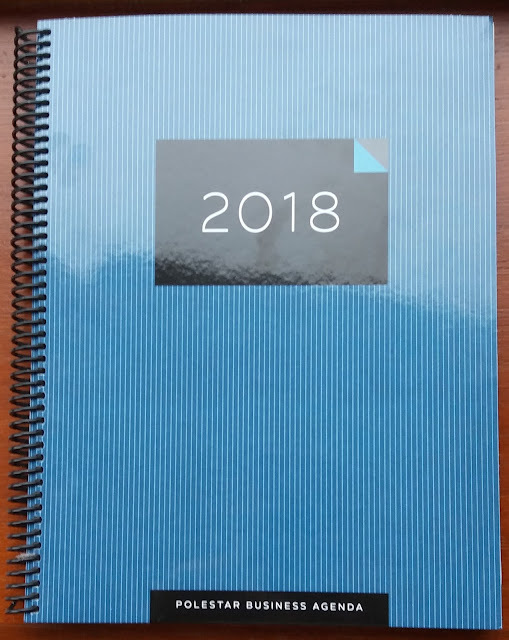 Moleskine spring 2018 catalog with 2019 planners! I like the new cover colors, especially the soft pink and blue. And how excited am I about the Harry Potter planners!!!!! Limited Edition notebooks are Barbie, Pokemon, Monopoly, Dr Seuss, and Transformers. Agendio 2018 planner with new features! I posted recently that Agendio.com has a new updated website. Well I'm very happy to announce they also have new planner features! Actually they come out with new features all the time, which is very exciting. 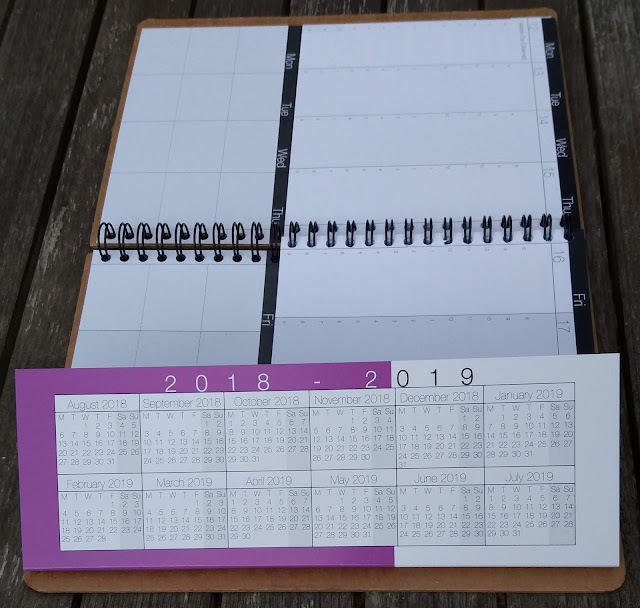 In fact just a few days ago they started making customized notebooks with a huge selection of page templates that you customize to your needs. So I was very excited to check out their new features and add some to my new planner. I'll walk you through the book. Here is the cover. I got to choose the design, color, and add personalization. I also chose the elastic closure strap with the gorgeous celtic knot design! I love it! The first page shows the model numbers of the weekly and monthly layouts I chose, in case you want to recreate a similar planner yourself. (Models 32098 and 32134) I chose the Medium size. You can choose any month to start your planner. I chose to start my planner in December so I could start using it right away. 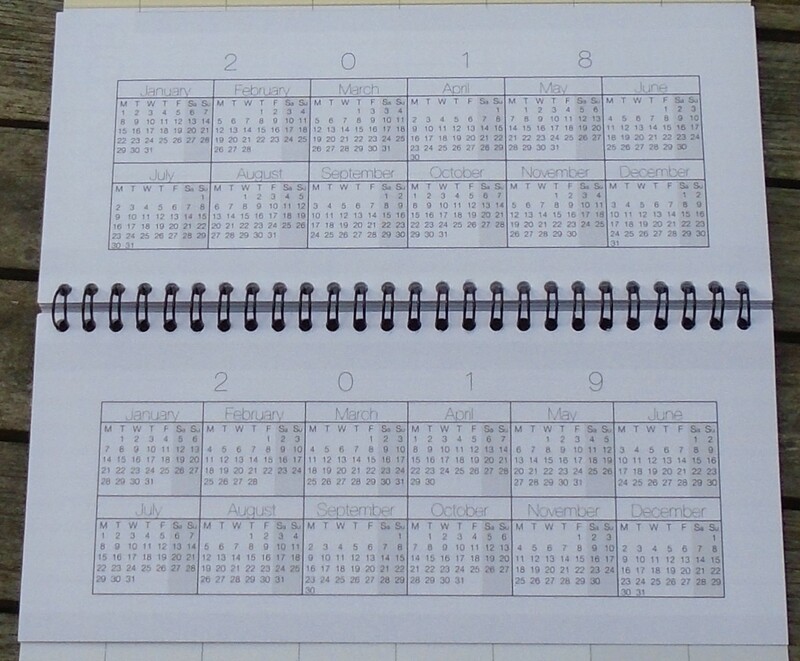 The first two-page spread has reference calendars for the current year and the next year. Below you can see my week spread. I apologize for the poor quality of my photos! It's really hard to get good light this time of year. In real life the paper is bright white and the print and colors are very clear. I chose timed vertical daily columns, and I was able to choose the start and end times, timed to the hour or half hour. I chose a different color for each month too. Below you can see the titles for my weekly dashboard. This space is completely customizable. You can divide it however you like, choose narrow or wider lines, and add your own titles. I have spaces for Notes, @ (at the computer), AFK (Away From Keyboard things to do), Home chores, Errands, and Work. Because I work from home, my days are a mix of billable work, home chores, family activities, and other responsibilities. I like to see everything I have going on in the week all in one view so I can figure out how to fit it all in. Also in the photo above you can see how I added activities like printing the school menu for the week every Sunday evening, submitting invoices on the first of each month, checking smoke alarm batteries each Saturday, etc. You can also choose whichever holidays you like (any countries and any religions) so those are printed on the days too. You can have your weeks and months start on any day, and on different days if you want. So for example you can have your months start on Sundays and weeks start on Mondays. Or if you work shifts, you can start your weeks with Wednesday or whatever day. I chose to start my weeks and months with Monday because school and work weeks start on Monday and I like to see my weekend days together. Below you can see I chose the traditional month grid planning pages. There are other formats to choose from for your monthlies. The area at the far right of the page is customizable. I kept it simple with open blocks but you can do lined, with titles, checkboxes, etc if you like. I chose to put my monthly calendars at the front of the planner. 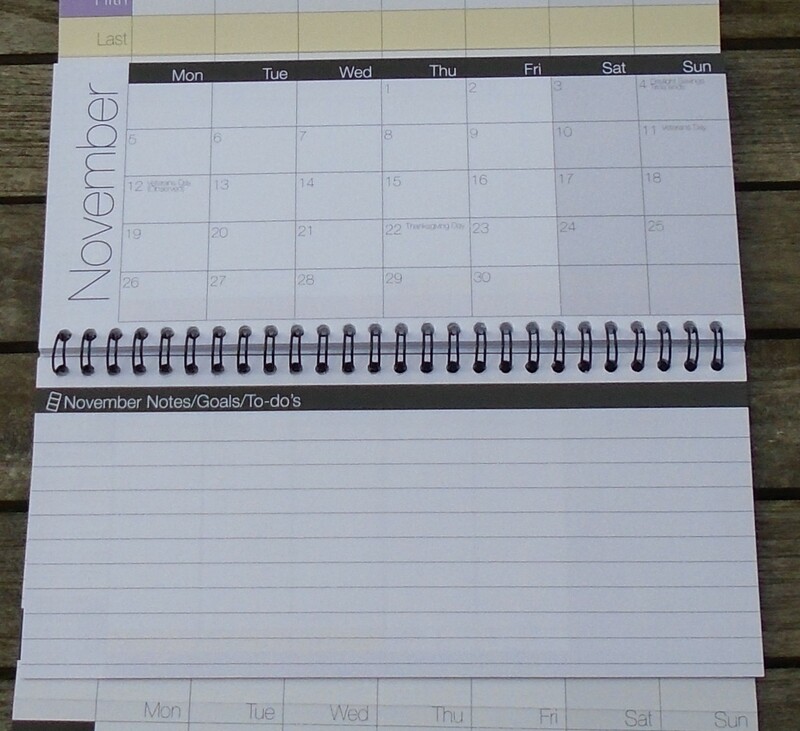 You can also choose to have them embedded in the weeks, or at the end of the planner. Between each month I added pages to track goals and evaluate my month. These pages are from their new Personal-Year planners. You can start your Personal-Year planner any day of the year, for example on your birthday, and track your progress all year. 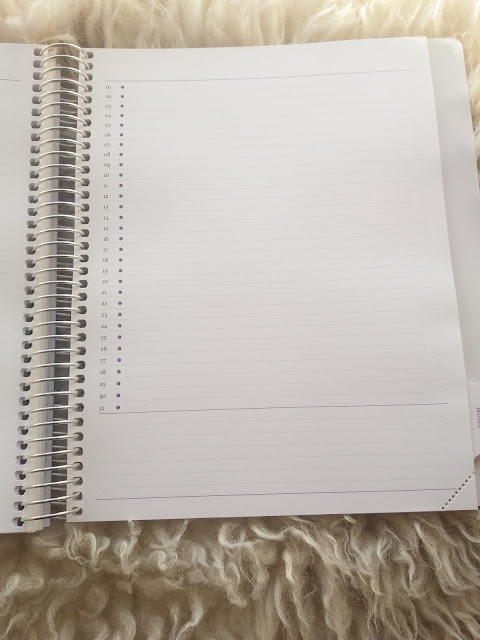 On the left page I track my personal goals with the categories of events, exercise, personal reading, family fun, home, and a blank one to adapt as I need. Across the top the headings of the columns are Goals, Actual, and Difference so I can set my goals and effectively evaluate if I'm reaching them. The right page is for my work goals for the month. The titles are Focus, Products to Promote, Blog Focus, Instagram, Posts To Do, and some blank space. This gets me to start each month with a clear work plan that I can refer to all month long. 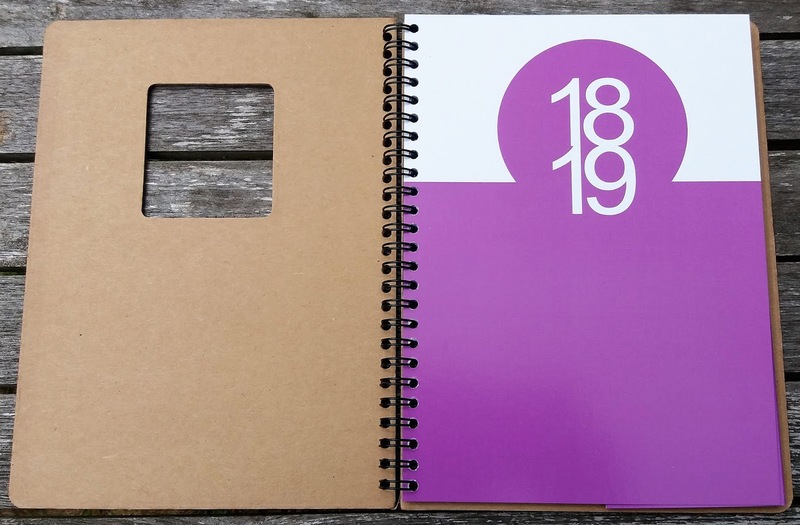 Here are some other add-ons I chose: Tabbed dividers for the months and my two additional sections for the future year and several pages for notes. I also chose tear-off corners to mark my current week. In my future year section I have Future Month pages so I can plan into the next year. These are found in the Extra Pages section on the website. Other Extra Pages you can choose include Flex Tables where you can adjust the column widths and the headers, Budget pages with your own categories, habit trackers, meal planning pages, contacts, dot grid or lined pages, and loads more! A new feature they just added very recently is you can have up to four pages after each week or after each month, or split two pages after each week and after each month. So for example you can have weekly meal planning pages, weekly habit trackers, lists and notes, and monthly goals trackers, budget pages, etc. all in your planner organized by week/ month. 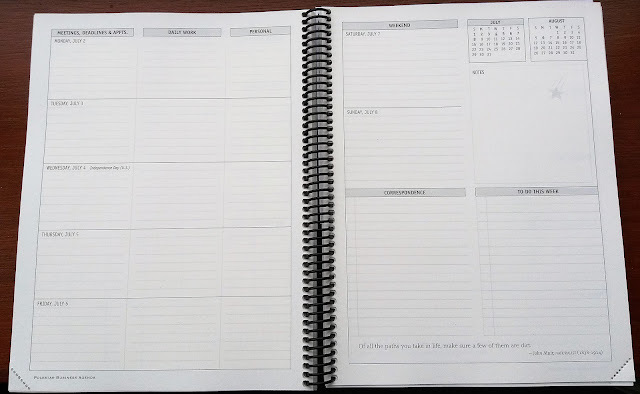 These features are available in bound planners or in inserts for Filofax/ Franklin Planners/ Daytimer or unpunched looseleaf to punch yourself for ring or disc bound systems. I also chose a back pocket for my planner to have a place to store papers. I've seen lots of other customizable planner websites before, but Agendio has the most options by far. 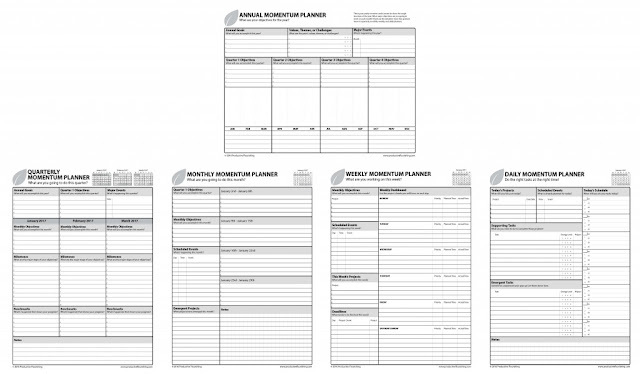 There are loads of planner templates to choose from in all kinds of layouts and sizes, with endless add-ons that you can customize exactly to your needs. I recommend Agendio to people all the time! 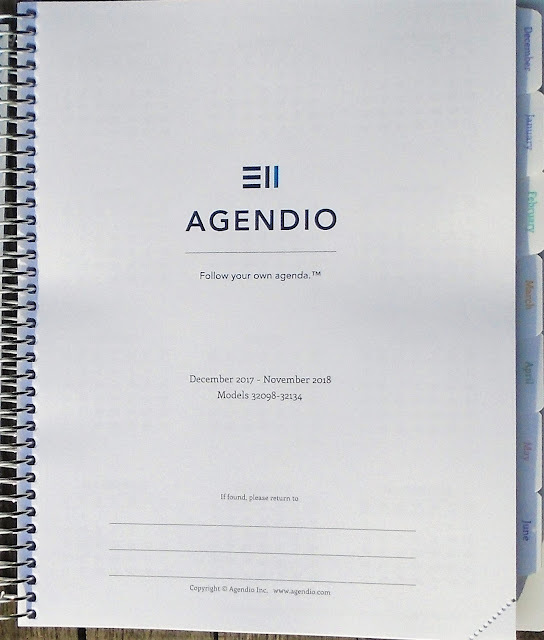 If you have never registered with Agendio before, please click through this link to see the information on the planner I made and register at Agendio. 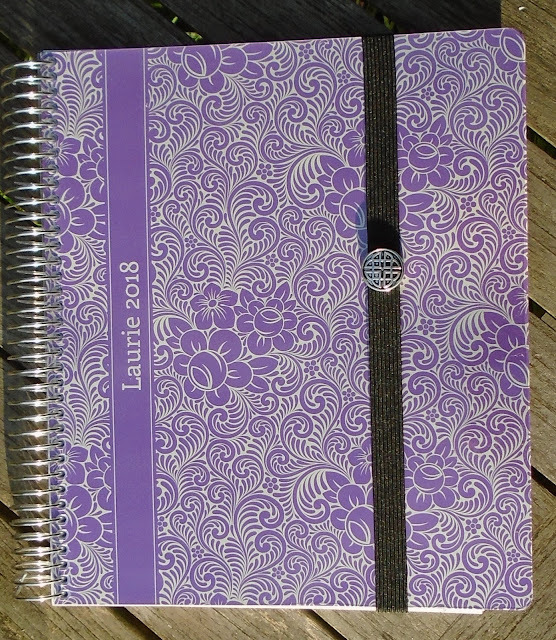 Then if you order a planner from Agendio, I will receive a discount on my next planner (which I will inevitably order, because customizing my own planner is very addictive!). It doesn't cost you anything at all, and I will get a discount on my next planner. Thank you!!! 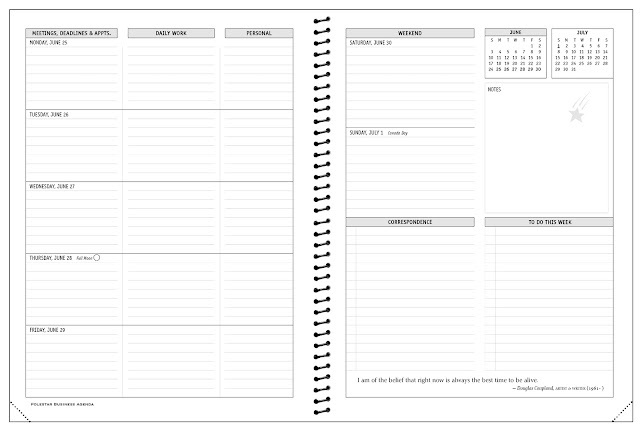 Many thanks to Agendio for allowing me to create this planner for free as a sample to review! 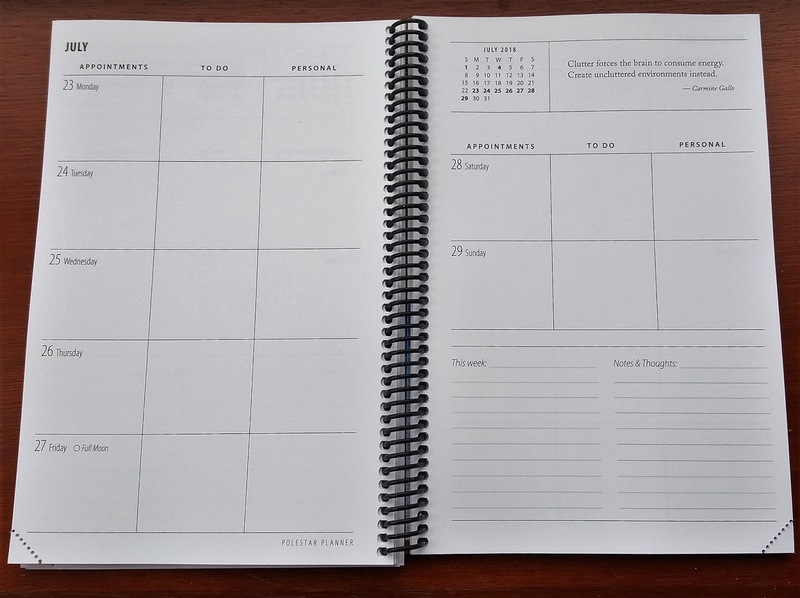 Way back in the day, I reviewed Charlie Gilkey's Productivity Flourishing Momentum Planners. A lot has changed since then! 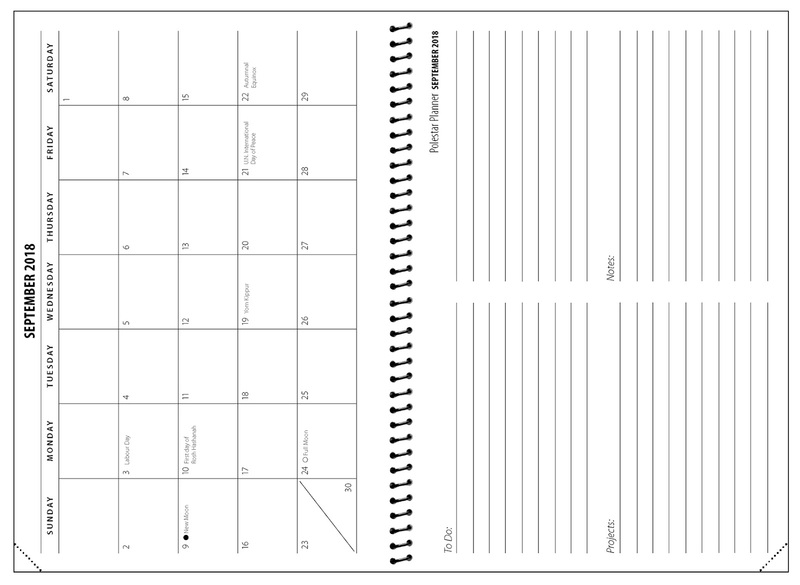 And some things have stayed the same, specifically how awesome these printable planners are. They are now even more awesome, because now they are fillable! More on that in a sec. The Momentum Planners aren't your typical appointment books (although they do keep track of appointments too). They are designed to get you to think about What Needs To Be Done. They start you thinking about the big picture, then they get you to narrow your actions down to what needs done on the quarterly, monthly, weekly and daily levels. This gets you to create a roadmap so you know exactly what you need to do and when you need to do it. 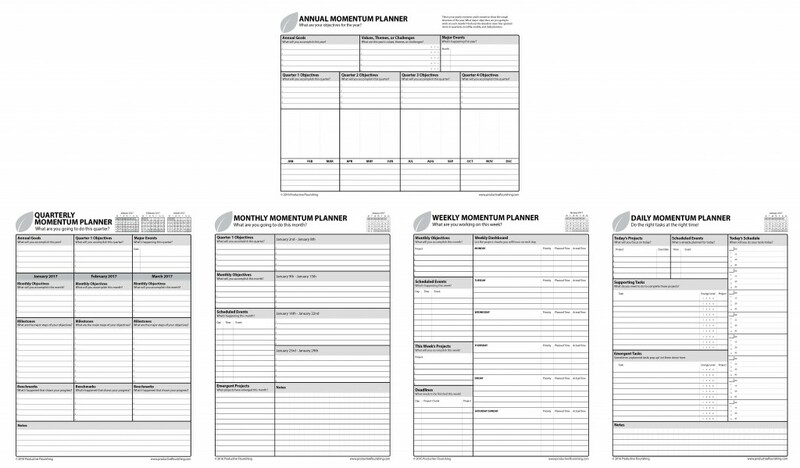 The Momentum Planners are available to purchase online for instant download so you can get started immediately on your road to maximum productivity. For only $12 you get the entire year of annual goals pages, quarterly goals, Monthly Action Planners, Weekly Action Planners, and Daily Action planners. When you buy the Momentum Planners, you get not only the planners themselves but also loads of support from Charlie himself with productivity emails, how-tos, podcasts, and access to the entire Productivity Flourishing community online. You can get a quick overview of the planners with some insight into how they were designed here. Click on the links in the descriptions below for Charlie's brief tutorials on how to use each type of planner. Start by getting an overview of your annual goals using the Annual Momentum Planner. This gets you to think about what you want to accomplish over the course of the year. Next, break these big goals down into Quarterly goals. (The Annual and Quarterly Momentum planners are only available in the purchased planners bundle.) Then think about what you can accomplish each month. The Monthly Momentum Planners will get you to think in more detail about what you can get done in the upcoming month, working around events and other projects. 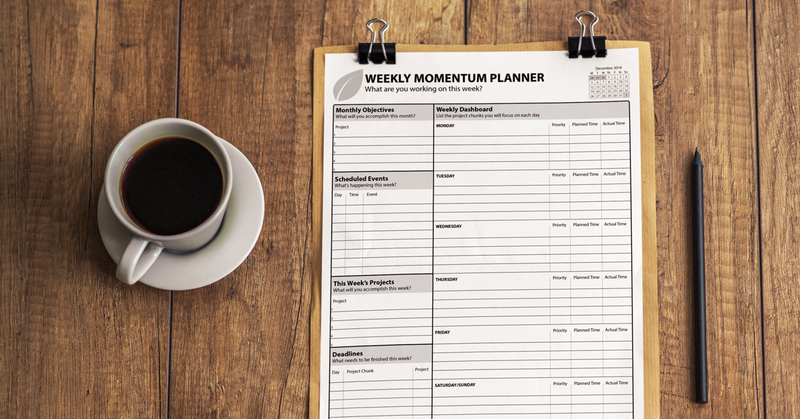 The Weekly Momentum Planner breaks down your week and lets you see what you've got going on, when you'll have time to work, and what your main projects/ deliverables are. The Daily Momentum Planner breaks down each day with plenty of space to write your scheduled events, projects, and tasks. The untimed daily schedule has 8 hours broken down into 15 minute increments so you can decide when you are going to work on what. You can use these 8 hours in any way throughout the day: 2 or 3 hours of productive work in the morning, another 2 in the afternoon, maybe a couple of hours in the evening to work on your side gig. Most people have about 8 hours a day of actual productive work; this setup helps you maximize that. I won't go into too much more detail about how to use the planners. Click the links above for lots more descriptions of the details. There's loads of advice and help on how to use them to best work for you. 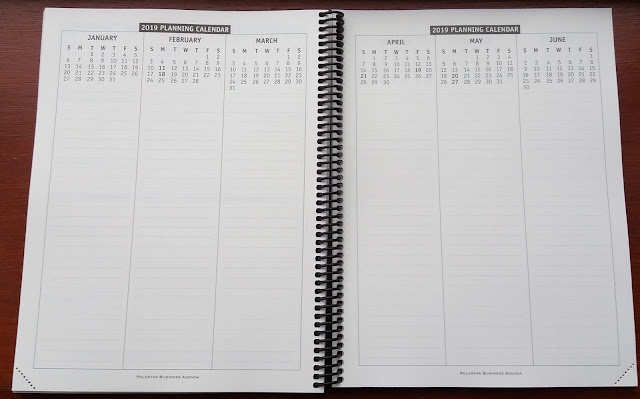 To get started, see Charlie's Quick Overview of the Momentum Planners. 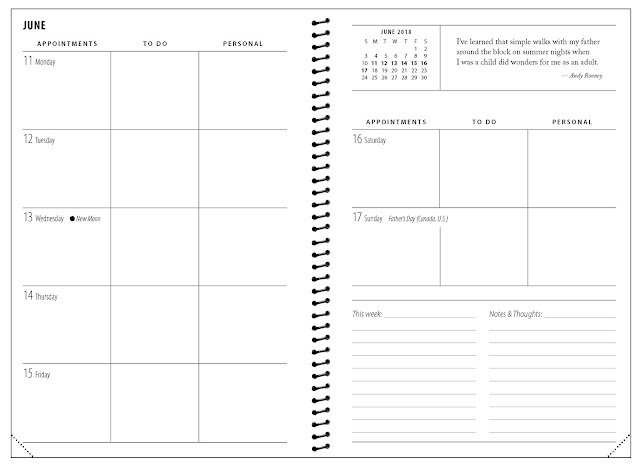 You can get the monthly, weekly and daily planners for free each month near the end of the month on Productive Flourishing. But if you don't want to wait for them to come out each month, I recommend buying the entire year to download all at once. 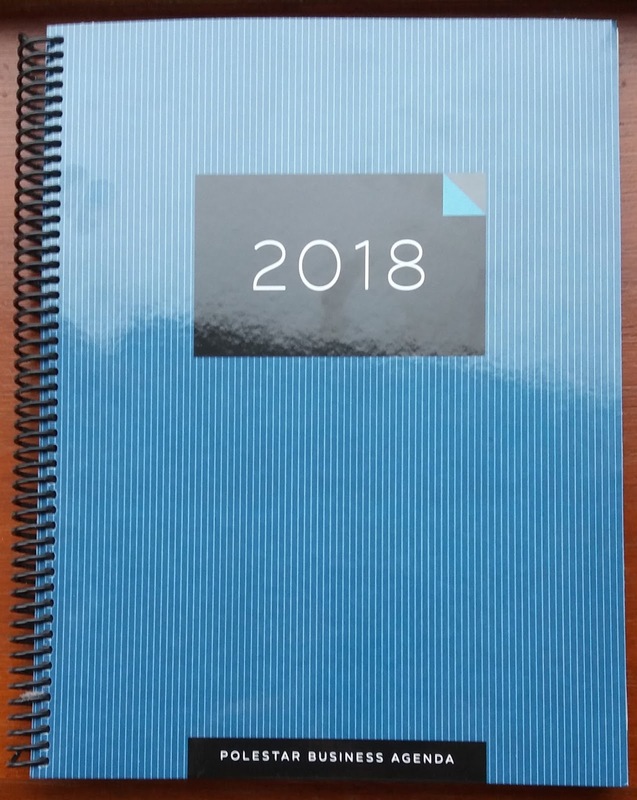 This has the huge advantage that you get all the planners for the entire year (with the annual and quarterly planners too) ready to use right away. There's no waiting for shipping. You get your planners and start using them immediately. You can print each planner page out as you need it, or print them ahead of time and hole-punch them to fit in a binder. 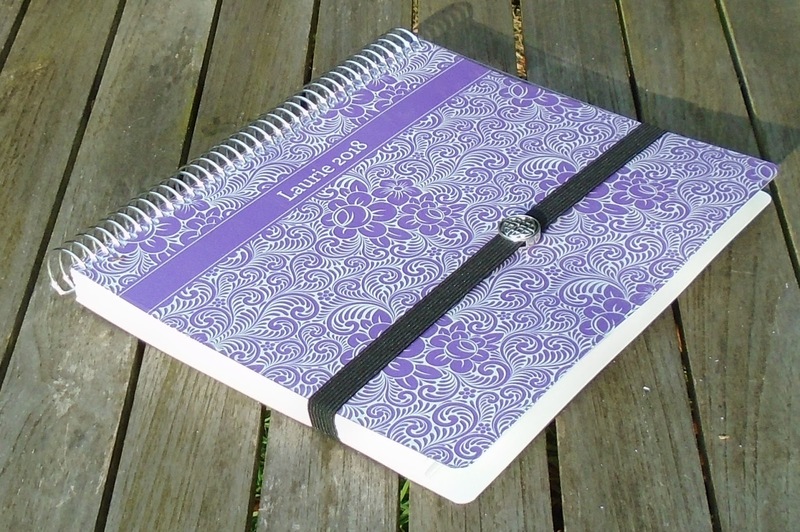 Or, you can print the pages and have them spiral-bound into monthly or quarterly books to be extra organized. Due to popular demand, the Momentum Planners are now fillable! Now you can type in your times, tasks, events, and goals, and print them directly onto the pages. This is great for people who like to keep it neat. But a word of advice: don't be precious with your planner pages. Don't be afraid to write on them, erase, and change things up. Life comes at you fast, and your day will rarely go exactly as you planned. These planners allow you to keep up with everything in real time, record emergent tasks as they come at you, and work everything into your plan. 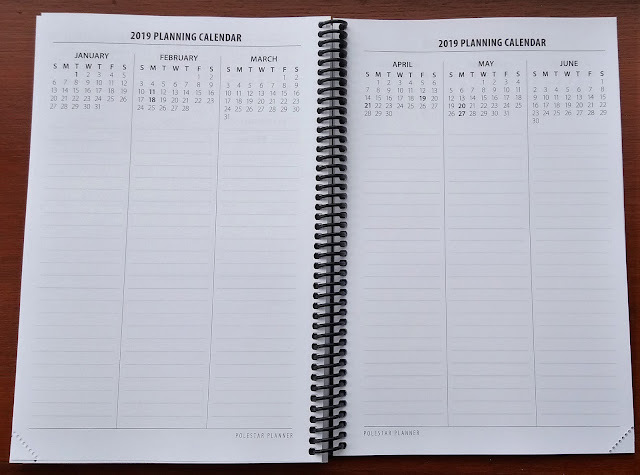 Another great thing about the planners being fillable is you can type up an outline or game plan for each project, then cut and paste each step into the appropriate week or day's Action planner. 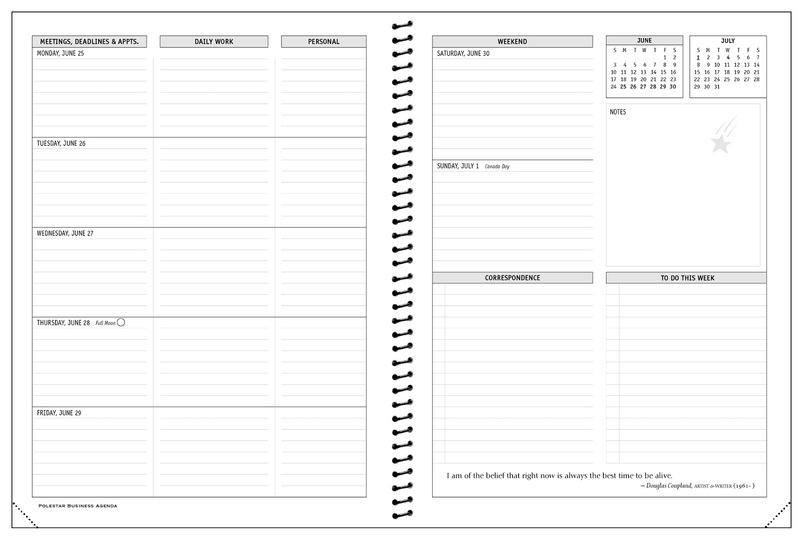 This will keep you on track with your timeline and your next actions built right into your planner. I want to take a minute to personally thank Charlie for all the planning, goal-setting, and life inspiration and encouragement over the years, both directly and through his website and planners. Charlie is an all around great guy, productivity guru, entrepreneur coach, and life guide for Creative Giants. Spend some time on his website Productive Flourishing for loads of help and inspiration. Thank you to Productive Flourishing to providing me with the entire 2018 Momentum Planners download for free as thanks for this updated review. I have purchased the planner bundles myself many times over the years and they are more than worth every penny. Really, for just one dollar a month, you get a hugely valuable product and loads of resources to help you maximize your productivity and creative output. 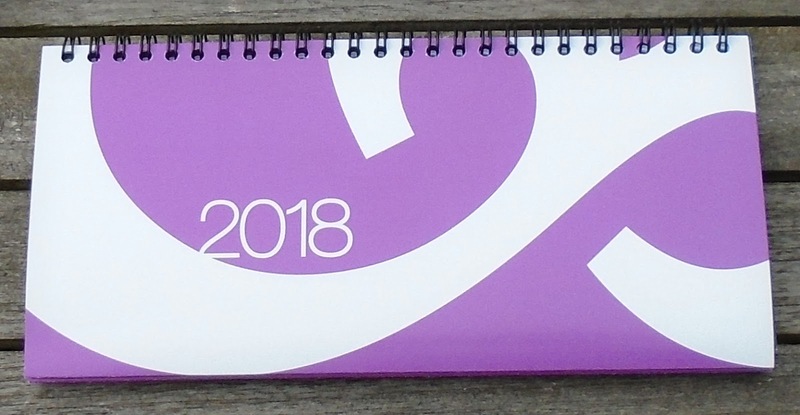 WeekDate 2018 planner: Only Write It Once! WeekDate planners have a brilliant Only Write It Once format that allows you to write your weekly and monthly recurring events only once, keeping everything visible in front of you all the time. 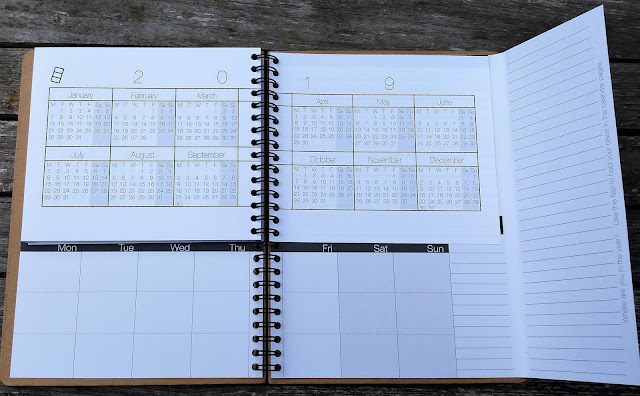 Nothing gets forgotten, you avoid double-bookings, and you don't have to write your repeating events over and over again throughout your planner! If you are tired of constantly feeling like you are behind, or things are slipping through the cracks, this is the planner for you. 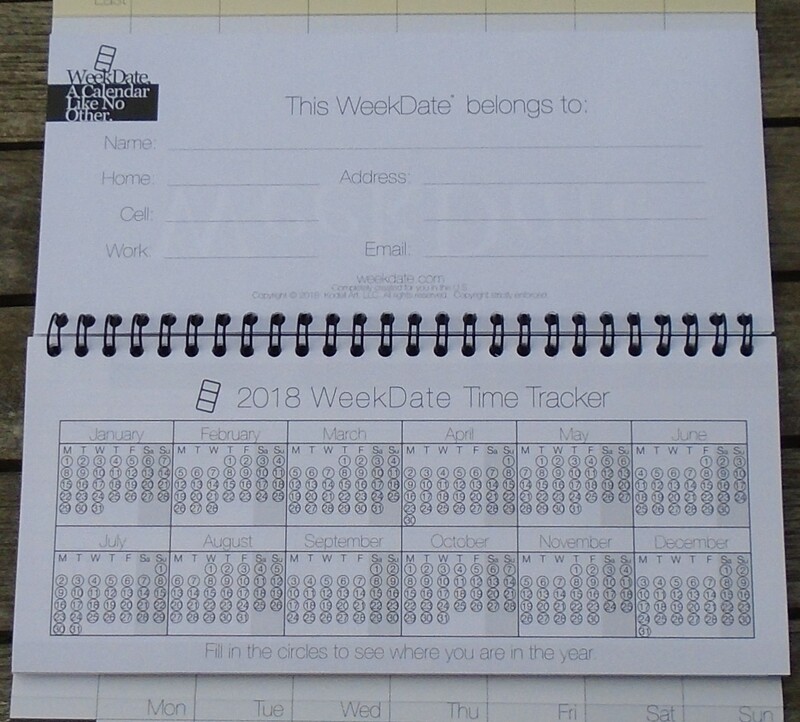 WeekDate also makes a great gift for busy people! To see more about how the Only Write It Once method works, click here. I'm a long-time fan of WeekDate because I think this system is excellent. Many thanks to WeekDate for providing this planner as a sample to review! All opinions are my own. Every year there is a variety of cover options for the WeekDate planners. This year I went for the gorgeous Passion cover of course, because purple! You can see all the cover color and design options here. 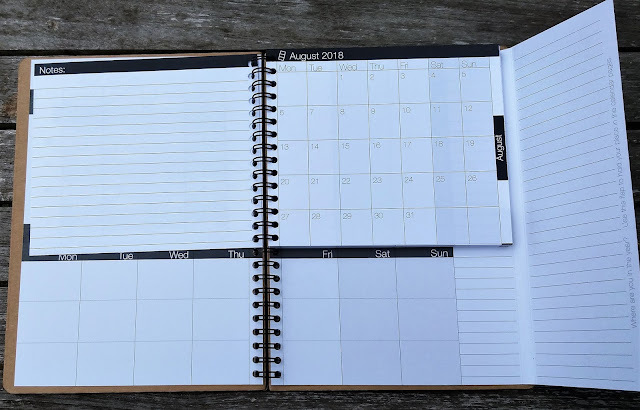 The WeekDate weekly planner is slightly larger than a checkbook and very slim and light so it's easy to carry with you everywhere, so you can plan on the go and never be without your schedule. 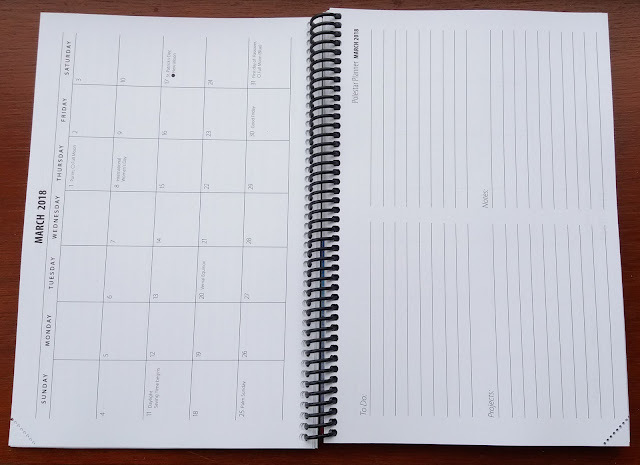 The WeekDate planner folds out to give you plenty of space to write. You get to see two weeks of your schedule pages at once so you can easily see what is coming up! The top section is for your monthly recurring events. For example if you have something on the first Friday of each month, or the last Thursday, this is where you write it. Color coding on the weekly schedule pages lets you easily see which week of the month you're in. 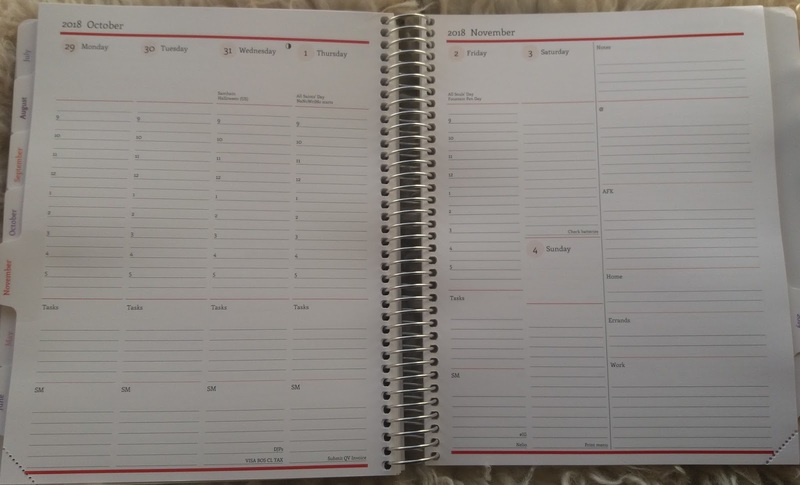 The dated pages are where you write daily specifics like appointments, tasks and one-time events. The bottom section is where you write your weekly recurring events. You can write everything here like your weekly staff meetings, your kids' activity schedules, which day to put out the garbage vs recycling (on odd weeks vs even weeks), reminders to wash water bottles or do home chores, etc. Everything that happens on the same day each week gets written here, so you don't have to write it over and over each week. Write these in pencil so you can change them when needed. 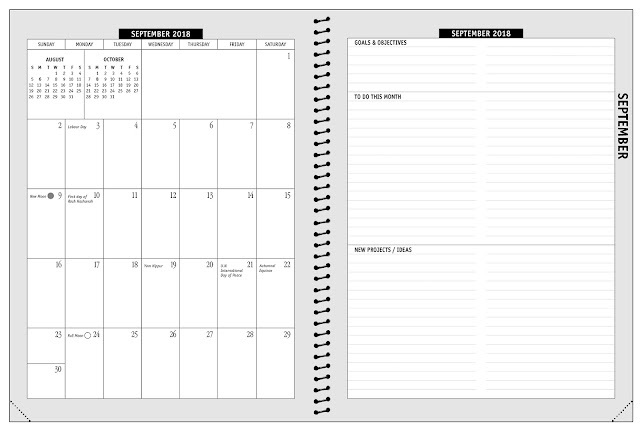 At the left of the bottom section is where you write things that happen on the same day each month, like paying your credit card bill on the 1st or submitting monthly invoices on the 30th. To see what you need to do each day you just look up and down that day's column to see it all at once! 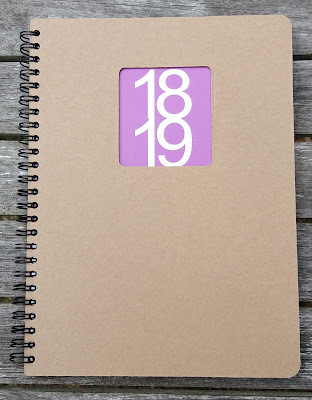 There are loads of other features in this planner too. Each month there is a monthly overview page and a page for notes and goals. Another feature I love is the Time Tracker. You bubble in each day as it passes to see your progress throughout the year. You can also use this to track days you've exercised, written pages of your novel/ thesis, No Spend Days, etc. It gives you a quick glance of the entire year. There are also annual overview calendars of the current and next year. The WeekDate pencils are the best, and are the most-stolen pencils in our house! 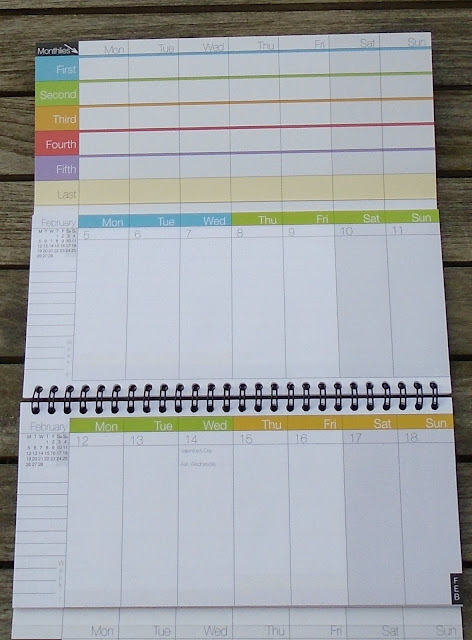 This portable and convenient planning system does a great job of simplifying scheduling and lets you stay on top of everything you have going on! 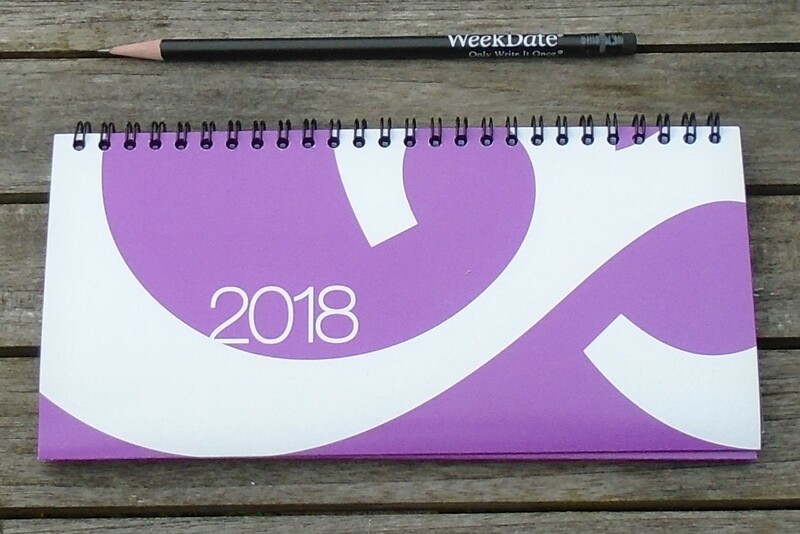 You can find WeekDate planners at WeekDate.com.